← Single Police Force – Mountain Rescue and “Mollie The Collie” completes the Corbett’s on Garbh Bheinn in Ardgour. Rockall – The Jubilee landing and a bit of history. There has been a bit in the news about Rockfall that many of us only know from the weather and shipping forecast as there has been a landing recently to celebrate the Jubilee. 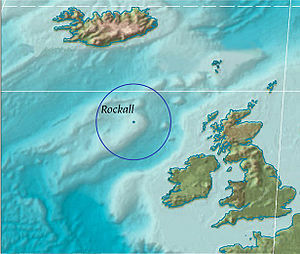 Originally planned as ROCKALLSOLO, a unique endurance expedition to be undertaken by Nick Hancock in order to raise funds for Help for Heroes, the aim of the expedition refocussed to be a reconnaisance mission for a future 60 day occupation of Rockall. Departing at the end of May 2012, Nick landed on Rockall and carried out various equipment checks and test in preparation for the future record breaking attempt on the rock. The date of departure, coincided with the Queen’s Diamond Jubilee weekend, and Nick aimed to be on the rock during the celebrations, and sent the first Tweet and Facebook update from Rockall. Upon landing, Nick became a member of the highly selective Rockall Club. Nick is in the process of a website which gives a good history of this unique piece of rock. It is well worth a look and the website is planned to get bigger. 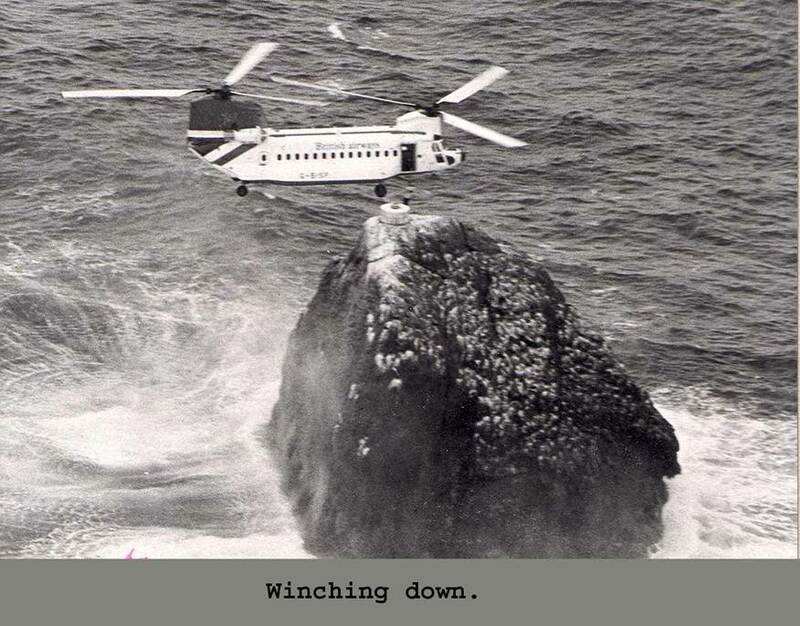 There was a programme on the Radio Scotland Out Of Doors programme this Saturday about his eventual landing on the rock which is not so easy from a boat in a heavy swell. It brought back many memories. A real scary winch out onto Rockall which is covered in very slippy rock. 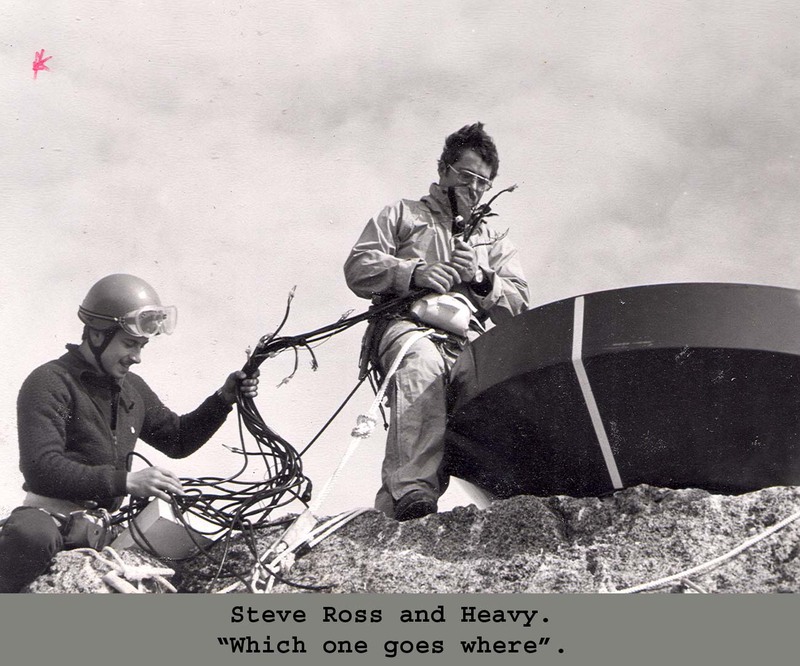 When we landed in 1982 to work with the Board of Trade it was to update a beacon on the rock, or so they said. I was a member of the RAF Kinloss Mountain Rescue Team at the time and was used to these kind of things, but this was a wee bit different. As you approached you coud see nothing until a tiny speck appeared in the sea this was Rockall all 80 feet of it. As the helicopter hovered above the down wash had the sea sweeping over it making it even more interesting. It was a scary winch down from the huge British Airways 234 Chinook helicopter and the helicopter down-draft was incredible.These were early days of winching from these huge helicopters. It was incredibly slippy underfoot and we had to take care. We had to prepare some ropes (safety lines) for the Board of Trade Technicians who were at the time very wary of the task ahead but coped incredibly with the location. I wonder if Health & Safety would allow this nowadays. We had a great three hours on the rock and even had time to rock climb on the stack much to the worry of the Board of Trade technicians , I must record these routes in the Scottish Mountaineering Club Journal! I doubt if anyone had done that before? We were overflown by a Nimrod aircraft (remember them) and a Navy boat was nearby but if we had fallen in not much could have been done for us, I think. The weather was so important as big waves can wash over Rockall in heavy seas, it is an incredible place. I am sure our visit had huge political support as this was as this was at the time of oil and fishing rights were and still are disputed in this area. It was also right in the middle of the cold war and the UK was worried about the Russians monitoring our rocket launching from the Hebrides, we were completely oblivious to all this. Anyway it was a great 3 days away from work, we were based in Stornoway and apart from the scary winch down we had a great time. Maybe we were “Government Agents” but had no clue what was going on at the time. “By authority of Her Majesty Queen Elizabeth the Second, by the Grace of God of the United Kingdom of Great Britain and Northern Ireland and of her other realms and territories, Queen, Head of the Commonwealth, Defender of the Faith, etc, etc,etc. And in accordance with Her Majesty’s instructions dated the 14.9.55. a landing was effected this day upon this island of Rockall from H.M.S. Vidal. The Union flag was hoisted and possession of the island was taken in the name of Her Majesty. This entry was posted in Mountain rescue. Bookmark the permalink. 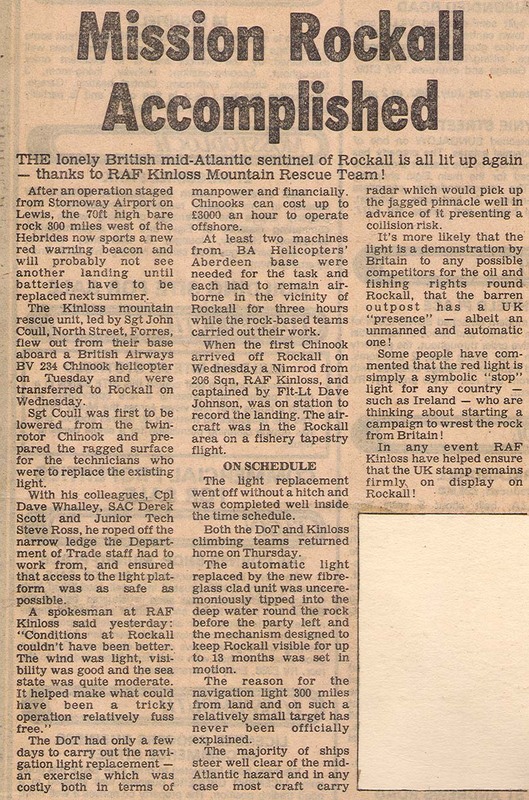 1 Response to Rockall – The Jubilee landing and a bit of history.